Fork Handles signed by Ronnie Barker & Ronnie Corbett A one off piece from the now sold out limited edition signed by Ronnie Barker & Ronnie Corbett. This is the very limited edition Ronnie Corbett refers to signing and describes as 'beautiful' in his autobiography 'And It's Goodnight From Him'. 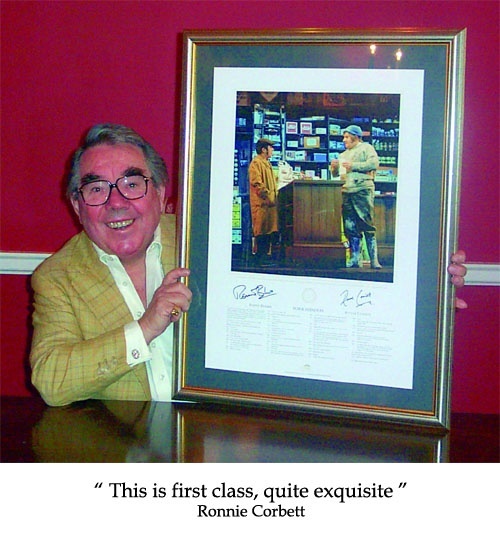 A one off piece from the now sold out limited edition signed by Ronnie Barker & Ronnie Corbett. This is the very limited edition Ronnie Corbett refers to signing and describes as 'beautiful' in his autobiography 'And It's Goodnight From Him'. 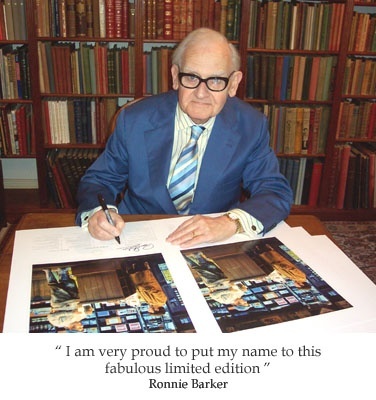 Leave your name and email address and we'll be in touch if a previously sold Fork Handles signed by Ronnie Barker & Ronnie Corbett Limited Edition Print comes on the market. 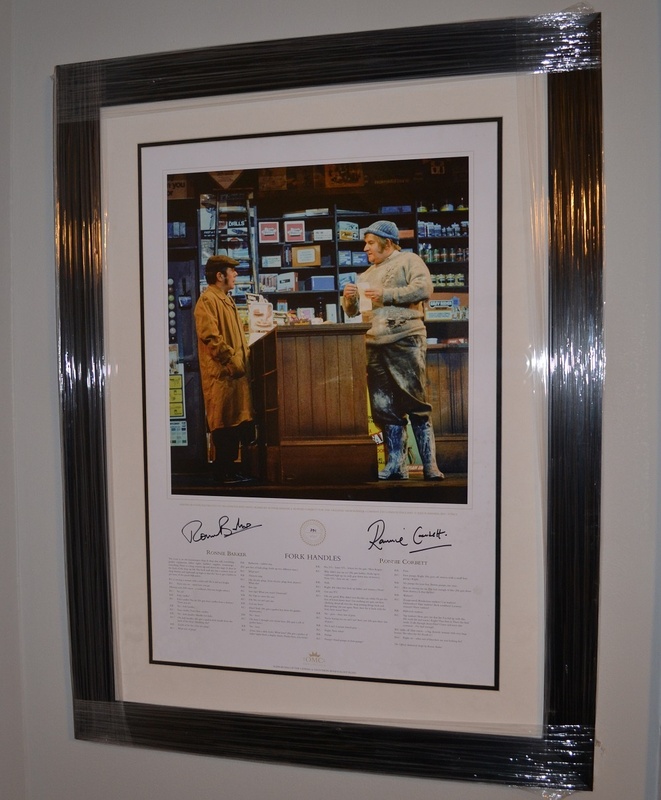 This beautiful lithograph print is individually signed by The Two Ronnies, Ronnie Corbett and Ronnie Barker. Size framed a substantial 735 x 555mm. Unframed 594 x 420mm. For more than 30 years The Two Ronnies entertained us with a mix of sketches, monologues and spectacular musical numbers in a career spanning 98 television shows, 12 series, several Christmas specials and numerous 'Sold Out' London stage shows. Of all the sketches they ever performed, the public voted Fork Handles 'The Greatest Two Ronnies Sketch Of All Time'. Now captured in print forever this official limited edition, photographed at The London Palladium, comes complete with the full, authorised classic script written by Ronnie Barker. In addition to a strict limit of 950 numbered prints, the integrity of your purchase is further safeguarded by our Official Document of Ownership & Certificate of Authenticity that is provided with every purchase. See 'Authenticity'. Professionally framed and ready to hang. A2 Difficult to see water marks. 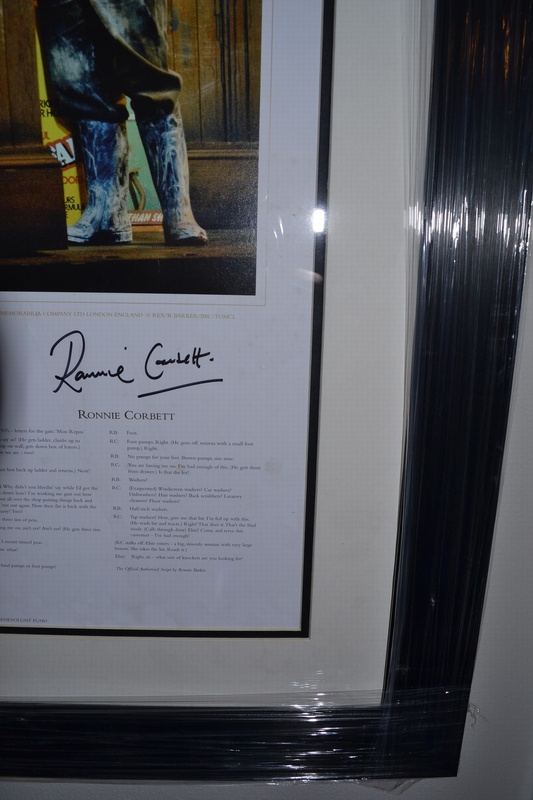 One 9mm spot in the white margin to the right of the text below Ronnie Corbett's signature and a small number of very small and light spots (approx 2mm) to the right of Ronnie Corbett's signature. We currently have this hanging in our office and neither area is very obvious and is not in the viewing/reading sight line.Otherwise in excellent condition and newly framed. Overseas buyers please contact us for delivery and insurance charges. Please allow 3 working days for UK delivery orders and 10 working days for international delivery.